i am welcoming you to share with the world your own inspiration, your life-experience essence. We all are unique expressions of God and so is our unique life and its various realizations. We are all born with the Buddha nature with infinite possibilities of enlightenment in this earthly school we call life. The Universe presents us streams of opportunities all through our life. i am welcoming you to send me your inspirations. it could be a simple statement of truth which you realized and what you realized. it could be a simple practice that you learned or developed which helped you discover yourself. it could be your moment of realization on an 'almost forgotten' saturday while walking in the park. it could be a beautiful poem you wrote and kept inside the diary from a wonderful moment of awakening. by the grace of God this blog reaches out to the world. 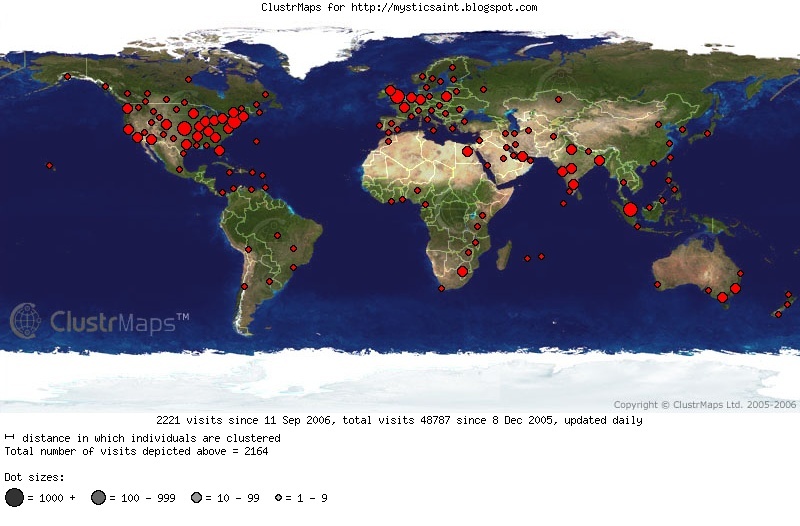 the image above is just a snap shot of only one week, how many people from how many places in the world come and visit this blog (credit: ClustrMaps). 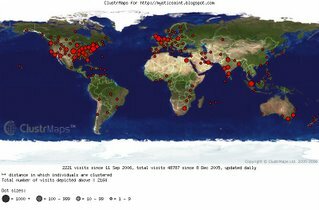 about 7000 visitors per month, 14,000 page views. God willing, its your moment while you may share your inner self, inner realization with the world. May God's blessings and inspirations be with you. Quick note: drop me an email here, mysticsaint@gmail.com with a subject line, 'guest blog'. write your post. i am not restricting on any word limit, but generally its observed that blog visitors love brief, concise and rich content. feel free.